Below you will find a list of all the ChanceHill Casino bonuses - offered to new players. The right side offers a casino overview (click to scroll through the images). Chance Hill is a brand new online casino for 2015. They launched in July and the site features some of the best software providers around including Microgaming, Betsoft and Softswiss. US players are not allowed register for a real player account. The site is however open to international players including those from Canada. The site offers a modern design with no download required. The instant play option means that players can enjoy all their favorite titles on any device including PC, Mac, iPhone, iPad, and Android devices. There are plenty of great bonuses to be had too at ChanceHill so be sure to check it out today. 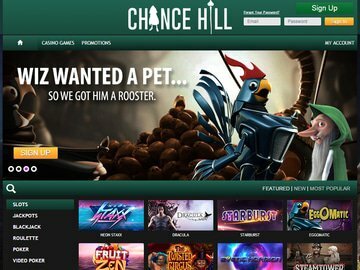 Chance Hill have just opened their doors and they are celebrating by offering a fantastic â‚¬300 welcome bonus ad 100 free spins. This is in fact a welcome package and is spread out over your first four deposits. The first deposit bonus is 100% up to â‚¬100 and 25 free spins on Starburst. The 2nd time you fund your account you will get 50% up to â‚¬50 and 25 free spins on Starburst. Your 3rd deposit gets 25% up to â‚¬50 and 25 free spins on Starburst and finally your 4th deposit will get you another 100% up to â‚¬100 and another 25 free spins on Starburst. Wagering requirements for these bonuses are 35x and any winnings from free spins are added to your real money balance with no wagering requirements. There are some excellent promos running on this new site including Monday Boost Bonus where you get 50% up to â‚¬50. This reload offer is only available on Mondays. On Wednesday's there is a reload offer of 50% up to â‚¬40. Saturday at Chance Hill has a promotion called Saturday Spinoff where you get free spins for every â‚¬/$ you deposit. Deposit â‚¬50 and you get 50 free spins. The final offering at present on this new online casino is the birthday bonus where you receive your age in free spins so the older you get, the more you get in freebies. It is important to read the terms and conditions as there are wagering requirements to be adhered to. It is also important to note that until the play through requirements have been met; the maximum bet that can be placed is â‚¬7.50. Be sure to also sign up for the newsletter so that you don't miss out on any new promotions that may launch in the future. ChanceHill offers games from a number of top software providers. Players will be able to enjoy games from Microgaming, NetEnt, Betsoft and Softswiss. These are some of the best games developers in the world and if massive progressive jackpots and 3D slots are your thing you will be in for a real treat. The majority of the games suite is made up with video slots titles including games such as Mega Moolah, The Dark Knight, Gonzo's Quest, Neon Staxx, Starburst, Spinata Grande, and more. Players can also enjoy a wide range of table games, bingo, video poker, keno and more. Softswiss have developed some excellent high quality games with amazing designs and these include video slots and card games. All the games are available in instant play options using flash and HTML 5 and this means that they are all mobile compatible. Players can enjoy all the great titles on all mobile platforms including iOS and Android via their browser. Deposit and withdrawal options are very important and Chance Hill has all the options you could need. The site will accept multiple currencies including USD, EUR, GBP. Depositing and withdrawing is easy too and players can choose from Visa, Maestro, MasterCard, Skrill, Neteller and more. Full details can be found on the casino website. Customer support is available 24/7 via live chat if you have any questions. For those who prefer to speak with someone, telephone support is available from 9am to 6pm (CET) Monday to Friday. Email support is also available. The website is multi-lingual and available in English, Spanish and French. Brand new for 2015, Chance Hill is a site that we were looking forward to testing. It really didn't disappoint and the gameplay is excellent on all devices. The Chance Hill bonus includes free spins and there are plenty of great games to keep players entertained and coming back for more. 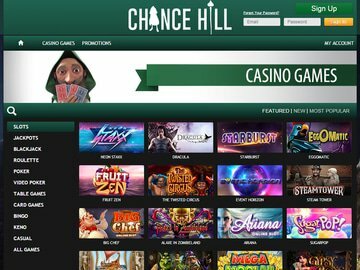 Using some of the best software providers, you can be sure you are in for a treat when you sign up for a real player account with ChanceHill online casino.